Travelling south from Bandung, capital city of West Java you will find yourself surrounded by mountains with magnificent sceneries, a rolling evergreen landscape of neatly cropped tea bushes, clumps of tropical forests, and misty hilltops. Amidst this fascinating setting, a surreal beauty radiates from an enchanting crater lake known as Kawah Putih or literary translated means the White Crater. 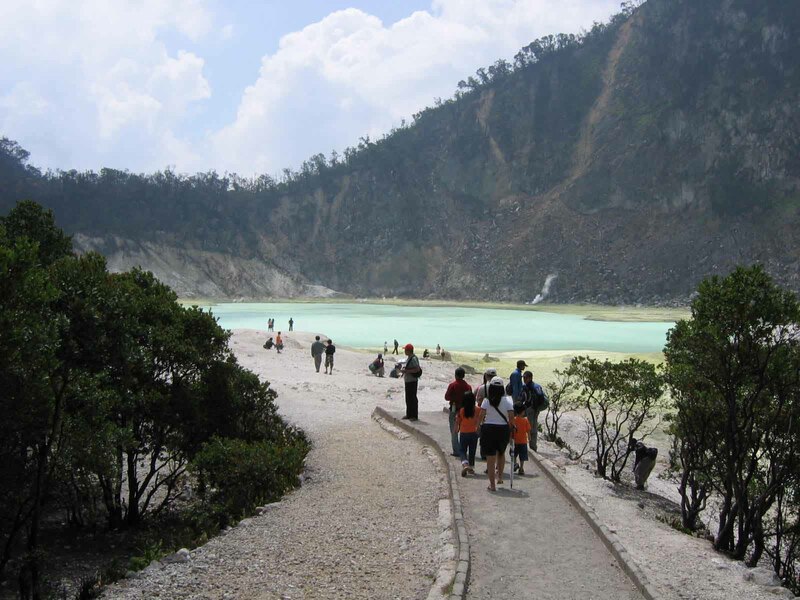 Kawah Putih is located near the charming little market town of Ciwidey, approximately 50 Kilometers south of Bandung. The Crater Lake is one of two craters of Mount Patuha, with the dry Kawah Patuha or the Patuha Crater located 600 meters to its northwest, being the other. Stepping into Kawah Putih is like entering a different realm. As the name suggests, the Crater Lake and its surroundings are dominated by a pale white color which radiates a rather hypnotizing ambience. The vast dormant volcanic crater is filled with surreal turquoise-colored water. On sunny days, the color of the lake is stark and bright, while on cloudy days, the entire crater can be shrouded in mist, which presents its own mystical beauty. The tree-clad cliffs surrounding the crater reach around 2,500 meters above sea level and make for a stunning backdrop, especially when the clouds start to roll in. The altitude here brings with it chilly temperatures, which in a way, will add to the magical splendor of Kawah Putih. The lake is said to have been first documented in 1837 by Dr Franz Wilhelm Junghuhn, a German botanist who carried out a considerable amount of research in Indonesia until his death in 1864 in Lembang, located just north of Bandung. At the time, there were various local stories about the history of the area. Birds were said to avoid flying near the region and some were even found dead after flying above the lake. Villagers in the area tended to regard the forest around the lake as eerie and somewhat mysterious. These stories prompted Dr Junghuhn to investigate, and so discovered Kawah Putih. He concluded that the birds flying over the Crater Lake died due to its high concentration of sulfur. Upon this discovery, a sulfur plant known as the Zwavel Ontginning Kawah Putih was established by the lake during Dutch rule on Java. In World War II the plant was taken over by the Japanese military and was operated under the name Kawah Putih Kenzanka Yokoya Ciwidey. Today the plant no longer exists , however, entry points to its tunnels, remnants of these mining activities can still be seen at several points around the current site. First opened for visitors in 1987, nowadays Kawah Putih is a favorite destination for tourists and day trippers who are simply stunned by its mesmerizing ambience. On weekends and on holidays, quite large numbers of visitors frequently visit the area just to immerse themselves in the mystical beauty of nature. The spellbinding scenery and surreal ambience of Kawah Putih offer their own unique sensation. This is truly the best place to refresh one’s mind and soul and get re-energized from the stress of daily activities. The dramatic setting of Kawah Putih also makes it a perfect place for those who enjoy the art of photography. The place has long been known as a favorite site for photographic sessions.